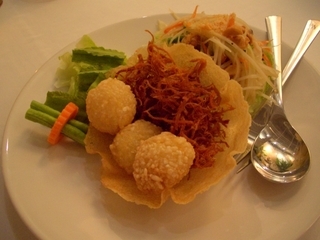 The Thai restaurant is the only place worth eating at from among the many available choices at Sofitel Grand Plaza. Suan Bua was very crowded with office workers the day we went for our group lunch. Normally I do not expect much, the catering for a large group of people probably means we have to sacrifice quality for quantity but this time I was proven wrong. 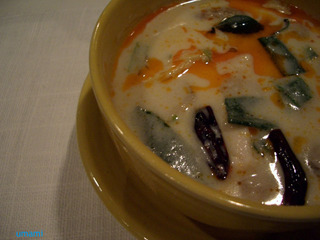 Highlights included chicken in red curry which was a delicious aromatic blend of spices and herbs, and accompanied with blanched cabbage and fried anchovies, one can easily down two plates of rice. There was no time to take pictures of the perfect little spring rolls, but everyone lingered over their delicately sour and velvety soup of chicken with mushrooms and lemongrass. Less successful was the dining at more upscale restaurant Naj. The blurb on the totally unreliable Tatler Restaurant guide gushed about this place is practically redefining high-end Thai cooking, but we kinda knew that we were in the wrong place the minute we laid eyes on the restored bungalow setting, the tuxedoed waiter and the costumed lady playing traditional music in front. But it was a humid night and the taxi had disappeared, so we decided to give it a chance. Impression was not improved when I saw the ugly plastic flowers lining the feet of the statues who were busy doing their thing. Maybe it was a hint of things to come. "We specialise in plastic"
Above: appetiser for two. Looks pretty but the taste was pretty generic. The only thing I liked was the crispy tomato rice. The chicken satay was tough and bland, the pastry cup thingies pretty to look at but indistinguishable in taste. Papaya salad with sticky rice balls and dried pork was more successful. Like the appetizers, seasonings and spicing has been muted down to cater for foreigners. There was another beef dish and a much-lauded green curry fried rice; both tasted as if they came out of a Marks & Spencer foil pack, fine in London but definitely not acceptable in Thailand. As an example of how bad they can thrash their food, we ate the worst possible version of pad thai here- the noodles, and some too-funky pieces of tofu, were all fried thoughtlessly in a ghastly sticky sauce, it was so awful we nearly spat it out. On the whole, we fared better with western restaurants. Our favourite was Kuppa, a place that the guide books say is popular with thirty-something people who come every weekend to eat while their chauffeurs wait outside for them. It wasn't that elitist feeling the night we visited. Being located next to a Somerset service apartment we saw more Japanese, Indians, Caucasians and some Singaporeans rather than local yuppies. The menu has many items to please everyone. Grills and salads. 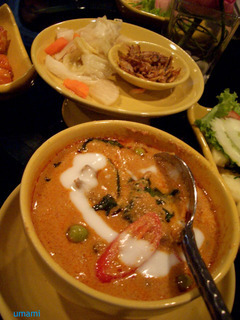 Curries. 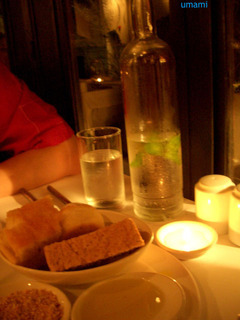 Mediterranean dishes. Pizza. Pasta. Pies. All we saw were the beautiful fruit sitting at the bartenders counter. The efficient waiter brought large glasses of juice over while we decided on dinner. The food, when it came, was most excellent. We tore at the generous plate of braised lamb shanks with couscous, the meat tender and taking on all the flavours of the accompanying peppers, tomatoes and herbs yet never boring like lamb shanks can get. My deep fried whole garoupa was so yummy we even ate the bones, the deep frying thankfully did not conceal its evident freshness, and the accompanying sauce of green curry with lychees was another fantastic surprise. I can imagine a less than bothered person opening a can of readymade curry sauce and tumbling a can of lychees into it and there you go. But the sauce at Kuppa was a lot more refined, the lychee's fragrance adding an intriguing nuance but its sweetness restrained so that the aromatics of the curry could shine as well. No pictures, we were so bowled over by the food we forgot. And then there were the 'white linen hotties' that we checked out, because the newspapers and the magazines say these are the ones making Bangkok such a happening food capital. Trendy independent restaurants with decor worthy of wallpaper* that apparently serves great food too. Most of these places can be recognised if you walk past them, they tend to have high ceilings painted in a bold colour as a dramatic backdrop for the antique-looking crystal chandelier, and diners get to sit in uncomfortable looking chairs designed by (or ripped-off from) designers with unpronounceable names. But we only had a few nights, one already wasted on that pretentious neo-colonial fraud called Naj, so we narrowed down our choices to two. The first was Eat Me. 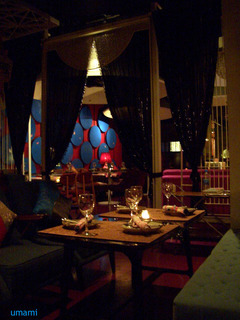 The restaurant is located on the second level of an art gallery, and is run by a laid back Englishman. The food was good, as in well-executed, well-balanced and very pretty looking, but not wow. The breads were the best part of the meal, and good breads score high marks with me, this place got bonus point because their breads come with dukkah, a spiced nut dip. Dip and breads were so good I overlooked the less than spectacular dinner that followed. 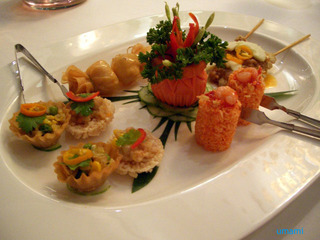 My spring roll with duck was quite lame compared to husband's starter of somen noodles with a big mess of tuna tartare. The tuna was beautifully seasoned, and very popular. But my mains of roast fish was considered better than his vegetarian risotto, well, risottos taste the same spoon after spoon so it is harder to get right. Eat Me is a beatiful space serving beautiful food to beautiful people, but to be honest, the food can do with a lot more passion and self-expression. Chi, on the other hand, demonstrated how it is possible to create a menu based on less than 10 ingredients in the kitchen. 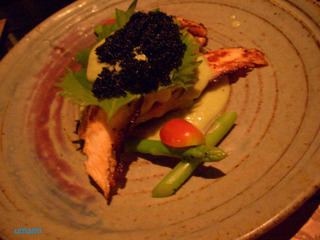 We ordered like 6 dishes (tapas-sized) and were astounded by the permutation possibilities of asparagus, cherry tomatoes, mayonnaise, cheap caviar, and salmon roe and miso. Almost every dish had these as base ingredients, save for the clam soup but I bet it had miso in it. Which is not to say the food was bad, on the contrary most tasted lovely on their own. Just not advisable to get greedy and order everything from the picture book menu. I defintiely give points to Chi for creativity. For creativity in making the most of their ingredients. And of course, for their decor. Located in fashionable neighbourhood H1 Project, people come to Chi more to admire the highly ecletic decor. Every section of the room has a slightly different look, and the lighting is suitably dim. Suitable for parties, and for couples too, there are some retro sofas good to snuggle into.